A day of balance, change and introspection. Going with the flow, doesn’t mean riding the rapids haphazardly. Look within and discover where your own strengths are. Tap into that spiritual energy and allow your abilities to guide your journey through the rocks. Quench the negative self talk with your own perfected skills and you’ll even out the scales of imbalance in your favor. In honor of Friday the 13th, I counted from the top of my tarot deck and selected the 13th card. I think she’s a fitting messenger for this day of transition and change. 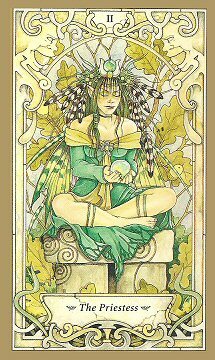 The Priestess reminds us that we always have a say in where we’re going, how we get there and why. Sometimes that means we must take time to sit quietly and look within ourselves to discover the answers that will help us guide our journey. We don’t have to sit in the raft and ride out the rapids holding on for dear life. Doing that allows fear to guide your direction and leaves angst, anxiety and worry to rule over your path. Trust your instincts and have faith in yourself and your abilities to choose the right course of action. Allow those talents to steer your craft through the treacherous waters and you’ll be able to avoid the hidden dangers. The Priestess is a leader, even more so than the Queens of the suits, because she is the one who provides wisdom and understanding over events. The Priest and Priestess use their connection to the Divine in their lives to rise above the pettiness of the physical world and look beyond the emotions that cloud our judgement. By doing this they are able to see the events that brought us here, understand the lessons and can see the karma in play. Align your energies today with that Divine force in your life. Permit yourself to view what’s going on in your life from a higher and more spiritual perspective so that you can understand what’s really happening at this time in your life. Let your emotions rest easy and be uplifted with empowerment as you take control of your destination. And know that it’s the right direction for you in this time and this place. It’s a day of good luck, this Friday the 13th. Use it to your advantage through the weekend and enjoy your life in balance, peace and harmony!